Please click on the map for original size of Cameron Highlands map. 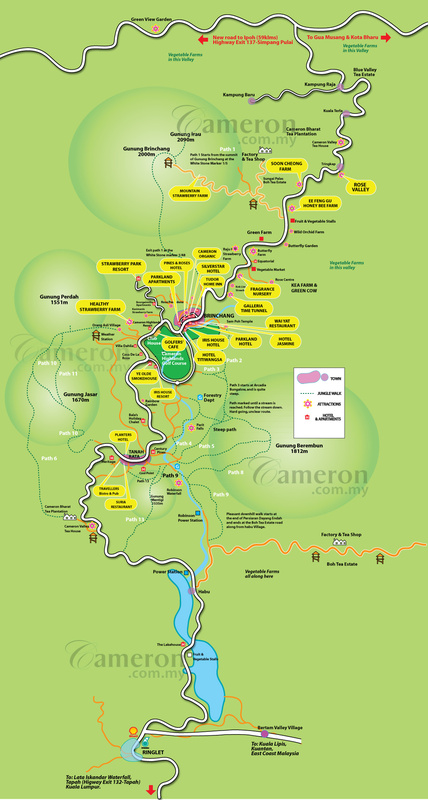 As illustrated on the map of Cameron Highlands, this township can be easily accessed via many highways that are connected to many major towns and cities around Peninsular Malaysia. Located only about 300 km from the nation’s capital of Kuala Lumpur, it takes about 3 to 4 hours to drive from there. Moving around in Cameron Highlands is very easy as there is only one main road that connects all the major towns like Brinchang and Tanah Rata. Most of the attractions here like the tea plantations, vegetable farms, bee farms in cameron and such are all well connected to this main road. There are express bus services that come from many major towns like Kuala Lumpur and Ipoh to Cameron Highlands. It is always recommended that you self-drive because getting to Cameron and getting around here is very easy. Perhaps the biggest concern when driving around Cameron Highlands is the traffic congestion which can be overcome by visiting during the low peak seasons. If you are coming from the southern part of Peninsular Malaysia, you will usually arrive through the North-South Expressway which you will need to take the Tapah exit. At the Tapah toll plaza, you will need to take the left turn where you will travel for about 60 kilometers through some challenging and winding roads before reaching Cameron Highlands. Driving along this road can be very challenging where you need to be extra careful and take precautionary steps, especially if it rains as there are reported landslides occasionally. However, you need to be extra careful when driving and maneuvering in the access roads leading up to Cameron Highlands. If you are coming in from the southern parts of Peninsular Malaysia, you will take the Tapah exit. This road leads you up to Cameron Highlands through Ringlet. From there you will come towards Tanah Rata before reaching Brinchang town. After that, you will reach Kea Farm and toward Tringkap before finally reaching Kampung Raja. Take note that the road is very winding and is not the best driving condition for those with car sickness. If you are coming from Kuala Lumpur, the entire journey will take at least 3 hours to reach Ringlet. Apart from the long and winding road, it can be quite rocky, especially during the year-end rainy season. For those who are coming in from the northern parts of Peninsular Malaysia, the journey will take about 4 hours coming through the Simpang Pulai highway. If you are coming in Kuala Lumpur, you can do so by using the Simpang Pulai exit which might take longer although the drive is more pleasant as compared to the Tapah road. You need to take the 137 exit and turn right after the toll plaza. Coming in from Simpang Pulai will take you on an opposite direction where you will reach Kampung Raja first, then Tringkap before reaching Kea Farm town. Further down will be Brinchang Town, Tanah Rata and finally to Ringlet. Driving down the Simpang Pulai highway can be quite challenging and sometimes dangerous mainly because it is further. Many vehicles experience brake failure due to constant braking down the slopes and as such, it is strongly advised that you do not speed. Another highway that leads to Cameron Highlands is the Kuala Lipis highway which comes in from the eastern part of Peninsular Malaysia. This journey will take approximately 3 hours if you are coming in from Raub. Apart from the 3 access roads, there are several others which have been planned for the next coming years.